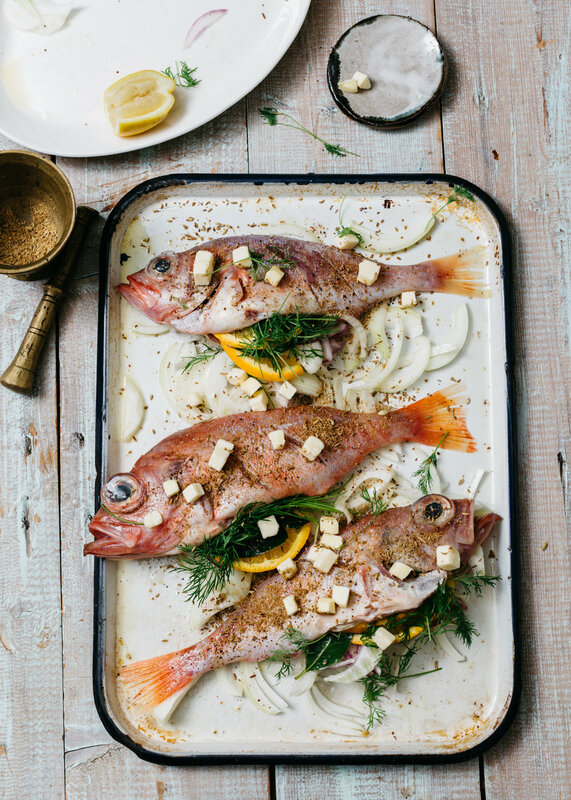 Any pan-sized whole round fish will work in this recipe, even the snapper or imported branzino seen on ice in every supermarket’s seafood case, but fresh local fish is delicious and far more sustainable. Scup (also known as porgy) and redfish are bony little 1–2 pound fish with tough, sharp fins and stubborn scales, so ask your fishmonger to thoroughly scale them for you, which can be a very messy job at home. Using kitchen shears, carefully trim away any remaining spiny fins, if needed. This recipe can be translated to the grill in summer with delicious results; just be sure to light a hot fire on one side of the grill and oil your grates exceedingly well. Once the fish is placed over indirect heat on the very hot grates, don’t move it! Leave it to sear for at least 3–4 minutes before attempting to turn it, and when you do, slide a fish spatula under and roll it carefully over its backbone so as not to spill the aromatics out of the belly. Continue to cook until the inside is hot all the way through, at least 10–12 minutes, but possibly up to 20 minutes total for a 1–2 pound fish; check with the tip of a knife to see if the flesh is cooked through and opaque, then remove from the grill and let it rest 2–3 minutes before serving. 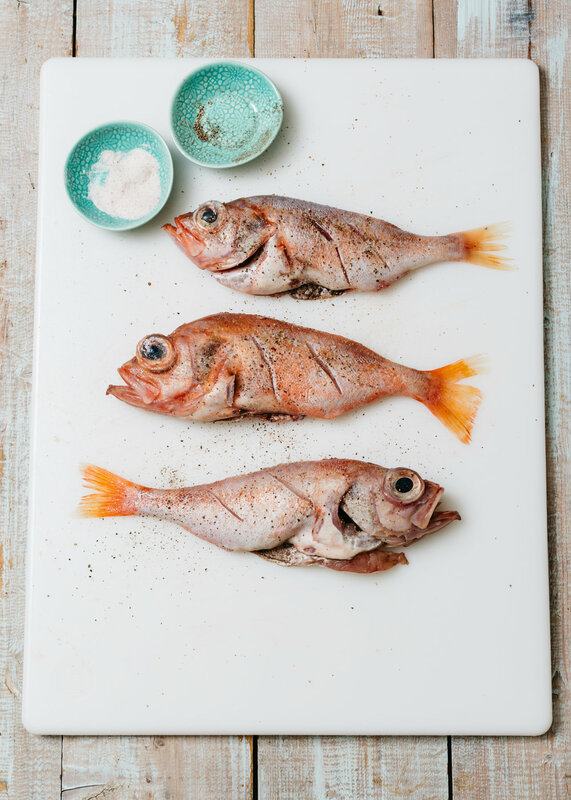 Big-eyed Acadian redfish, also known as ocean perch and rascasse in French, are small, (about 1 pound or less), low in fat, with a flavor like red snapper, and abundant in the northern waters of New England. Here, citrus, butter and toasted fennel permeate the fish while it roasts, then it’s topped with a crispy raw fennel and cucumber salad, with plenty of vinegar and dill. Use the freshest fennel you can find, preferably from the farmers market, and don’t skip the ice water bath: Without it, the fennel and cukes will go limp in the dressing and you’ll lose the contrast of soft, succulent, buttery fish with the cold, crispy salad. Using a very sharp knife, make 2 or 3 slashes through the skin of the fish on both sides. Season aggressively with sea salt and pepper, rubbing the seasoning into the slashes, then arrange them on a baking sheet on top of the sliced onion. Drizzle with olive oil and lemon juice. In a small skillet over medium heat, toast the fennel seeds until fragrant and nutty. Pound to a powder in a mortar and pestle, then sprinkle it all over the fish, inside and out. Stuff the lemon and orange slices into the cavities and tuck in a few slices of red onion and fennel, and the reserved dill stems. Dot with the butter cubes and place in the oven to roast for 15–18 minutes, or until the tip of a knife inserted into the flesh close to the bone comes away easily, and you can see the flesh is opaque. 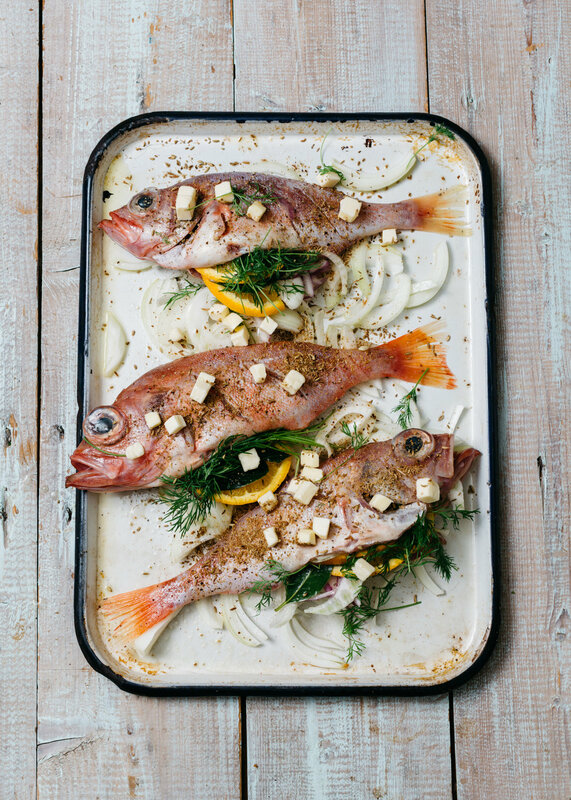 Remove from the oven, squeeze lemon over each fish, and allow to rest 2–3 minutes before serving. While the fish roasts, toss the remaining sliced onions and fennel with the cucumbers in an ice water bath, allowing them to crisp up for 10–15 minutes. Drain, spin dry, and add to a salad bowl with the dill. Dress with vinegar, salt and pepper, and olive oil, tossing to combine. At the table, using 2 large soupspoons, carefully pull the meat away from the bones and serve each diner some fish and onions alongside a generous portion of cucumber-fennel salad. Once the top filet is removed, lift off the spine and serve the bottom filet.